We’re thrilled to announce that Chantal and Nick’s gorgeous Greystone Mansion wedding photography is being featured by MODwedding. As always, it was an absolute pleasure working with Annette at Simply Natural Events, and the incredibly talented team of vendors she assembled to make this sweet couple’s glamorous dream wedding a reality. Chantal and Nick came all the way from their own slice of paradise in Bermuda to meet their friends and family, from all around the world, to celebrate their wedding in Beverly Hills at Greystone Mansion. The elegant, art-deco-inspired decor was such a great fit for the classic, romantic atmosphere of their historic wedding venue. A tasteful mix of mirrored surfaces, mercury glass, calligraphy, black, white and gold accents, and clever, modern touches surrounded the bride and groom, and their guests, with the warm, luxurious, opulence of another era. After the ceremony, dinner and dancing, everyone moved over to The London West Hollywood hotel for an equally glamorous, poolside, rooftop after-party. Click over to the MODwedding.com feature to see all the pretty details. 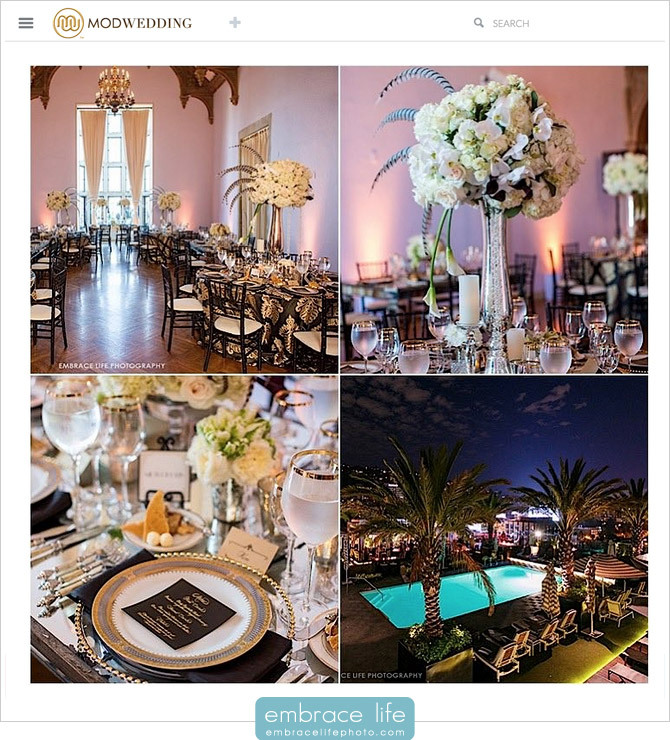 Thank you MODwedding for showcasing the beautiful wedding of a fantastic couple and the inspiring work of some of the finest wedding vendors in Los Angeles.